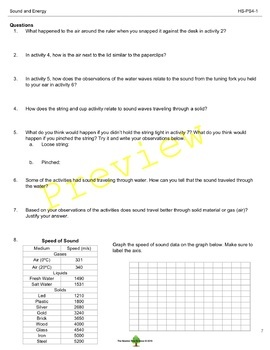 Simple lab/activity to get students thinking about sound and waves. Students complete each activity and fill out a data table on their observations. Next they develop their own questions regarding the activity and as a class come to a consensus one 3 questions. Students then read background information on waves and answer 2 questions. 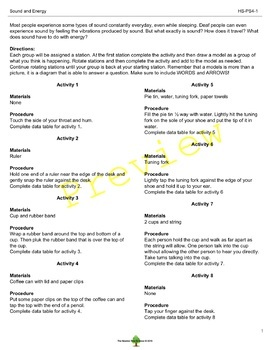 Next the students complete models of each of the activities and the CER for each of the questions. Lastly, the students answer questions regarding the activity and graph data on speed of sound waves in different mediums. 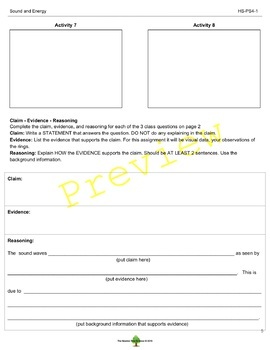 Teacher instructions and answer key included. 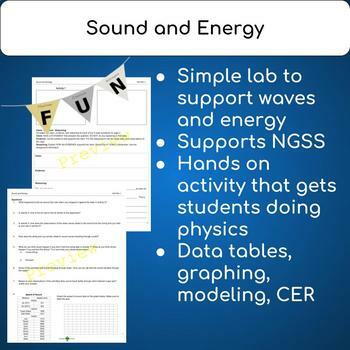 Supports *NGSS standard HS-PS4-1 Use mathematical representations to support a claim regarding relationships among the frequency, wavelength, and speed of waves traveling in various media and MS-PS4-1 Use mathematical representations to describe a simple model for waves that includes how the amplitude of a wave is related to the energy in a wave. Looking for more wave lessons? Follow Me for more freebies, notification of sales and new product. Visit my store Newton Tree Science, for more physics and chemistry lessons. Feedback on lessons is greatly appreciated! Not only do you get TPT credit by doing so but feedback provides others with valuable information on lessons. To provide feedback go to your My Purchases pages then click on Provide Feedback button next to the purchase.